ExportFeed App for BigCommerce Released! We are proud to announce the release of ExportFeed App for your BigCommerce store. With this app, you can really expand your sales and profits and meet your expectations. How? 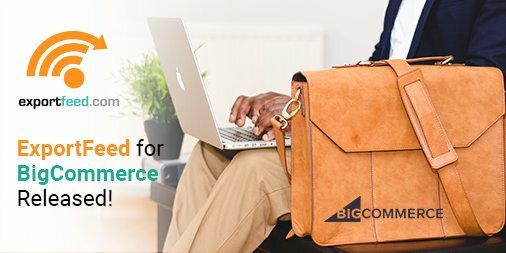 ExportFeed for BigCommerce serves to create and sync your data feeds to 40+ high performing merchants like Google, Amazon, eBay, Etsy and more. So more visibility of your products means more sales! How to get this ExportFeed for BigCommerce App? Login to your BigCommerce store and on the on the BigCommerce Control Panel, you should click on the Apps. Then click on the Marketplace tab. Now search for ExportFeed on the BigCommerce marketplace and click on the ExportFeed. Next page you will get the details about ExportFeed plugin and the option to Install. Click on the Install button and Confirm the Install. After you confirm your installation, you will be see the options to create or manage feeds in the next screen. Technical skills not required due to easy and intuitive user interface. Feed creation for 40+ high performing merchants of your choice. Reduce your hassle of manually listing products to the merchant sites. Create your product feed in CSV, TXT or XML format as required. Easily map your local product category with the merchant category. Save your time and effort for creating and updating the product feeds. We’ll really appreciate if you send us your feedbacks and comments regarding this app. ExportFeed plugin for Amazon Marketplace Released!